Pineapples have been a symbol of hospitality, as well as a coveted commodity, throughout history. In colonial times, growing and harvesting pineapples was extremely difficult. Because of this, pineapples would be displayed as a welcoming symbol when sailors brought the fruit home. Nowadays, pineapples carry this same reputation, although perhaps not as distinctly. Whether you like to just eat pineapples; decorate with the fruit; or adorn your home in pineapple accents; this fruit can be incorporated into your home’s decor throughout the year. 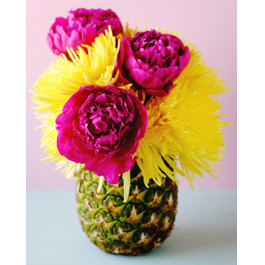 Here are some ways in which you can decorate with pineapples. 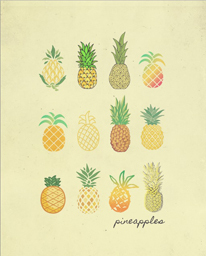 The simplest way to decorate with pineapples – and really with any image or theme – is a printout. Whether you use a program like Photoshop or choose to browse Pinterest for printouts, you have almost absolute freedom when it comes to choosing color and size for your pineapple accents. The printout on the left is from the blog live laugh rowe, which blends vibrant and soft colors to create an image pleasing to many tastes. And remember: using different images with a similar color scheme, or the same image with differing color schemes can create a charming mural-like display on your wall with picture frames. Search for unique frames, and watch a piece of paper with an image on it transform into an art piece you will be proud to display in your home. 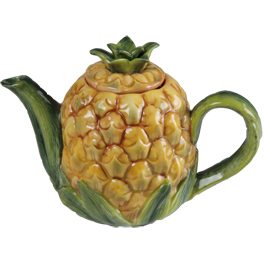 If you aren’t looking to create a pineapple-themed room, it is best to scatter pineapple accents throughout your home. 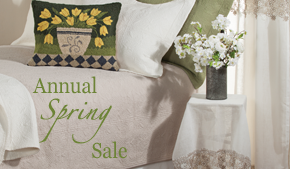 The best way to do this is with décor like pillows, rugs, light fixtures, and even kitchen accents like teapots and salt & pepper shakers! A yellow pineapple coordinates with many rustic, as well as more modern colors, allowing it to complement your style and home décor no matter what your design preferences are. Although sprinkling small accents, like our Pineapple Centerpiece Lamp Finial, throughout rooms in your home may not seem to draw a “wow” factor, guests will notice the attention to detail you’re paying with this hospitable fruit symbol. Of course, you can always use real pineapples to decorate. Especially for a tropical-themed party or a summertime barbecue, a hollowed out pineapple with a lighted tealight inside makes a perfect centerpiece and lighting accent. Then, you can serve the removed fruit to your guests! colored blooms to make the whole piece stand out. This entry was posted on Thursday, February 26th, 2015 at 11:47 am	and is filed under Apartment, Bathroom, Bedroom, Candles, Crafting, Decorating, Lamps and Lighting, Rugs, Thursday's Theme, Uncategorized, Wall Decor. You can follow any responses to this entry through the RSS 2.0 feed. You can leave a response, or trackback from your own site.